A pop of colour, our Yellow Recycled Plastic Ruler will work just as well for students and professionals alike. It has a strength and durability to it that ensures long service. It has been inspired by the classic and traditional ruler design, with a slightly curved top surface and an entirely flat side. In choosing to do so, this allows the ruler to sit flat on any surface and provides the chance to take accurate measurements. The use of 100% recycled plastic put it in line with eco-friendly directives and ensures it can be recycled again at the end of its life cycle. Each of the four corners and edges are rounded and smoothed off, minimising the risk of injury especially when used by younger children. The bright yellow design contrasts well with black ink used to mark out each centimetre and inch measurement indicator. Place alongside two marks and effectively take a note of the accurate distance between them. In turn, it can also be used to draw the perfect straight line - a skill that is needed in a great many tasks these days. From architects drawings to mathematical problems, it will stand with you as you make your way through any project. These rulers are available in large bulk options, to suit the budget and requirements of your organisation. For orders over 10, we provide each one at an individual price of just £0.24. 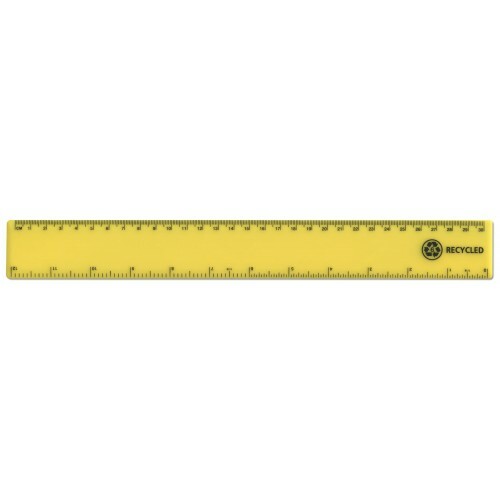 And, for orders over 100, this individual ruler price drops down to £0.18.